The lighthouse building is listed as a building of Architectural/Historic interest. The island lies at the mouth of the Firth of Forth, 5 miles from the Fife mainland and 11 miles from East Lothian. The island’s coastline is rocky; its surface covers 140 acres and slopes gradually from vertical 150ft cliffs on the west side to sea level on the east. Its history dates back to the early custom of founding Monastic settlements on small islands and it was manifest in the choice of St Adrian, when, in the ninth century, he and his brother monks established their retreat on the Isle of May. Later, in the twelfth century, King David I founded a monastery on the island which he granted to the Benedictine Abbey of Reading in Berkshire. This was on the condition that nine priests be placed there to celebrate divine service for the souls of the founder, his predecessors, and successors, the Kings of Scotland. The Benedictine monks continued in peaceful occupation until the fifteenth century when the monastery was possessed by the sea of St Andrew. This act saw the disbanding of the settlement, and with the ravages of marauding invaders and the passage of time the buildings gradually fell into disrepair. Today the only remaining evidence of the island’s religious past is the fragmented remains of the chapel built in the twelfth century and dedicated to St Adrian. The island is perhaps best known among naturalists for its bird observatory which was launched in 1934 under the auspices of the then newly formed British Trust for Ornithology. 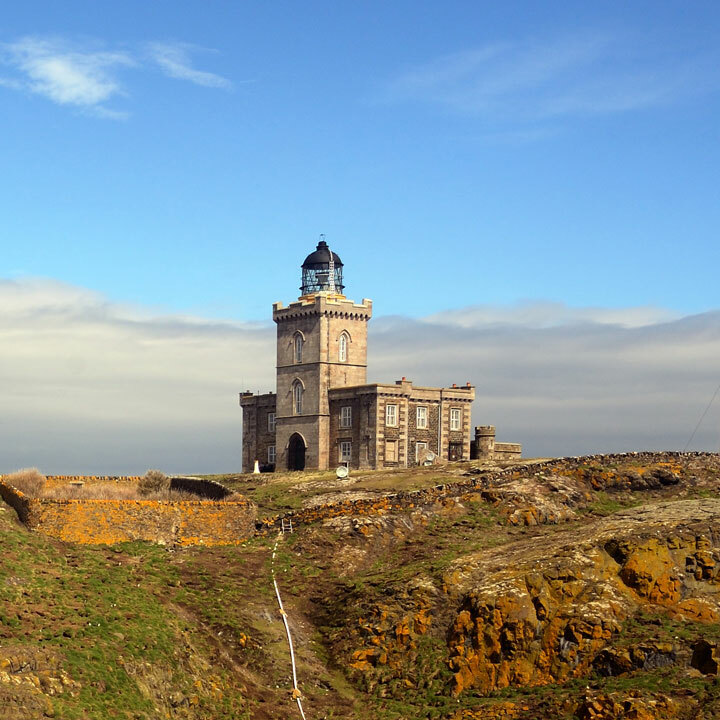 It was on similar lines to the famous German Observatory at Heligoland and was the first in Scotland and only the second in the British Isles, the other being on Skokholm Island off South Wales. The studies of bird migration, varied seabird breeding populations, the island’s own breed of mice and the island plant communities are all added attractions for visitors, in addition to the geology, the history and the lighthouses. The ledges of the West and South Cliffs carry a large breeding population of guillemots, shags, kittiwakes, razorbills and a few fulmars. Hundreds of puffins nest in burrows on the east and north of the island; the flatter areas of the island’s surface are almost entirely occupied by herring and lesser black-backed gulls. The island was declared a National Nature Reserve in 1956. A lighthouse has been operating on the Isle of May since 1635 in which year King Charles 1st granted a patent to James Maxwell of Innerwick and John and Alexander Cunningham of Barnes to erect a beacon on that island and to collect dues from shipping for its maintenance. This light, however, was a crude affair and consisted of a stone structure, surmounted by an iron chauffeur in which there burned a coal fire to serve as the illuminant. The coals were hoisted to the fire by means of a box and pulley and three men were employed the whole year round attending to the fire which consumed about 400 tons of coal a year. In 1790 a lightkeepers’ entire family was suffocated by fumes, except for an infant daughter, who was found alive 3 days later. Despite the fact that the light was regarded in its time as one of the finest in existence, its value as an aid to navigation, judged by today’s standards, must have been decidedly limited. The character of the light would naturally vary considerably with almost every change in weather conditions; One minute it might be belching forth great volumes of smoke and the next blazing up in clear high flames, while changes in wind directions would tend to alter its appearance. An easterly wind for instance would have the effect of blowing the flames away from the sea so that the light could scarcely be seen where it was most wanted. An instance of this occurred on the night of 19 December 1810 when two of HM Ships NYMPHE and PALLAS were wrecked near Dunbar because the light of a lime kiln on the coast had been mistaken for the navigation light on the Isle of May. In 1814 the Commissioners purchased from the Duke and Duchess of Partland the Isle of May, together with the old coal lighthouse which was built in 1816. It was converted to a Rock Station on 9 August 1972 and looks a bit like a small castle with its protective battlements. About a quarter of a mile from the lighthouse and on the east side of the island stands the tower and domestic buildings of the “Low Light”. A light was first exhibited from this small lighthouse in April 1844 to act, in conjunction with the main lighthouse, as a lights in line so that the mariner could avoid the treacherous North Carr Rock some seven miles north of the Island. However, when the NORTH CARR LIGHTSHIP was established in position in 1887, there was no longer a need for the Low Light and it was, therefore, permanently discontinued. The buildings are now occupied by members of the Ornithological fraternity. There have been many improvements to the light since 1816. One September 1836 the light was changed to the first British dioptric fixed light, with an improved form of refractor made by Messrs Cookson of Newcastle. Work began in June 1885 on the station on a elaborate scale. The ornate tower built in 1816 with its extra rooms for visiting officials, had accommodation for only three lightkeepers and their families. Dwellings were needed for three more, and an engine house, boiler house chimney stalk, workshop and coal store. These were built in a small valley containing a freshwater loch, 270 yards from the light and 175 feet below it, and the current led up to the tower by conductors. The two generators, each weighing about 4½ tons, the largest so far made, has a capacity of 8,800 watts, which could be controlled so that the whole or only part of the current was used. The single automatically-fed arc lamp, with two spares in reserve used carbons 1½ inches in diameter. A core of soft pure graphite made these burn with great steadiness, and an average of 440 feet per annum was used. The single automatically-fed arc lamp, with two spares in reserve used carbons 1½ inches in diameter. A core of soft pure graphite made these burn with great steadiness, and an average of 440 feet per annum was used. The tremendous current bridging the arc startled a stranger entering the lightroom by a sound like a circular was passing through exceedingly knotty timber, according to one visiting lightkeeper. A three-wick paraffin oil lamp, kept trimmed and ready for use in case the electric current failed, could be lighted and put in focus in about three minutes. The new light, which was shown from December 1st 1886, gave four flashes in quick succession every half minute, It had an elaborate dioptric apparatus which enabled Thomas Stevenson’s dipping plan to be adopted so that the strongest beam of light could be directed much nearer the shore in hazy or foggy weather. The light as about three million candlepower when on machine was in use, and double that with two, or about 300 and 600 times more powerful than the old fixed oil light. he geographical range was 22 miles, but the light was picked up and recognised by sailors at 40 and 50 miles off by the flashes lighting up the clouds overhead. To ensure efficient working, the whole establishment required the services of a Principal Lightkeeper with technical experience as Engineer-in-Charge, four Assistant with no special training – two for lightroom duty and two to attend the engines and boilers – and an auxiliary whose main responsibility was looking after the station horse and the carting of supplies, which was no light task, with a special supply of 150 tons of steam coke for the engines 1888 – 1889. The total cost of the installation was about £22,000 including the lighthouse buildings already in use. Maintenance at not more than £1,050 per annum was about three time that for an oil light, but it was reckoned that the cost per candlepower produced was relatively small. Electrical power indeed proved to be the most penetrating form of light, although its superiority was much reduced in hazy weather. In really dense fog even the powerful light on the Isle of May could not be seen from the foot of the tower owing to the heavy cost of maintaining the generating plant and the greatly increased power of oil lights made possible by the incandescent mantle. The electric light was therefore discontinued at the Isle of May in 1924. The station then cost about £2,884 per annum to maintain compared with £1,031 for an oil light the original equipment had become unsafe, and then the question of renewal was raised by D A Stevenson who proposed reverting to an oil light, for which the Commissioners obtained Board of Trade sanction. The Royal National Lifeboat Institution rewarded the lightkeepers on the Isle of May for saving lives when the MATAGORDA was wrecked in 1872 and the German Government sent a binocular field glass each to Robert Grierson and Laurence Anderson who helped the crew of the PAUL lost on Inchkeith in 1888. In 1930 two young lightkeepers rescued four men by swimming off to the Aberdeen trawler GEORGE AUNGER wrecked on the North Ness and helping them ashore. In 1972 the lighthouse became a “rock” station which meant that the keepers’ families no longer lived at the lighthouse but at the shore station in Granton. The Isle of May was demanned on the 31 March 1989. The operation of the light is controlled by a photo electric cell which determines when darkness has fallen, and the light, which has a range of 22 miles, is automatically turned on. Monitoring of the light is by UHF Radio monitor to Fife Ness Lighthouse then by PSTN to NLB Headquarters in George Street Edinburgh. Isle Of May is one of Scotland's Outstanding Lighthouses.